The NHL's annual photographic yearbook lives up to it's own high standards with Reflections 2011 . 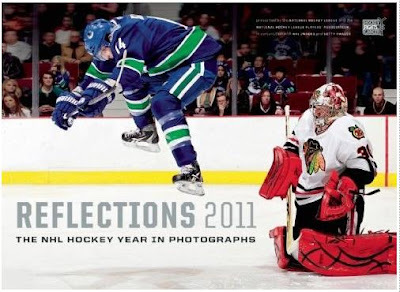 All of the great moments of the magical 2010-11 season are captured forever in an amazing collection of stunning photographs. Feel the chill as you revisit the great outdoor games where both Pittsburgh's Heinz Field and Calgary's McMahon Stadium became, for a day each, the world's largest backyard rink. And the Boston Bruins Stanley Cup championship. Ad Corey Perry's breakout year. From the first drop of the puck to the hoisting of the Stanley Cup, it's all here. The game is played such a blinding speed. With one blink you miss so many details. The camera catches these details, making this book extra special. I especially love the many facial expressions captured in so many of these 150+ thrilling hockey photos. As always, one of the best parts about this book is a share of the proceeds from the sale of this book will donated to the joint NHL/NHLPA Hockey Fights Cancer initiative.